Updating your Velop system’s firmware keeps your Wi-Fi features current and fixes many performance issues. We recommend allowing automatic firmware updates. This happens overnight and only takes a few minutes. 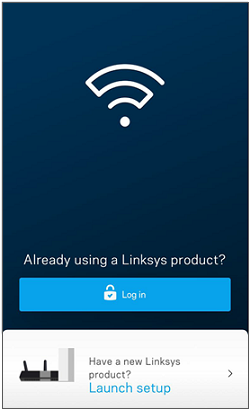 On your mobile device, launch the Linksys app. Log in to access the Velop dashboard. For instructions, click here. Tap the Menu icon, then tap the Velop Administration feature. By default, the Automatic Firmware Update feature is enabled and will update the firmware whenever a new version is released. If you have more than one node in your Velop network, each will be updated. If you turn OFF Automatic Firmware Update, you will get a prompt when a new firmware release is available. When this happens, tap Update Available to upgrade the firmware. QUICK TIP: To turn ON or OFF automatic firmware upgrades, toggle the Automatic Firmware Update switch, and tap Save at the top right corner of the dashboard. 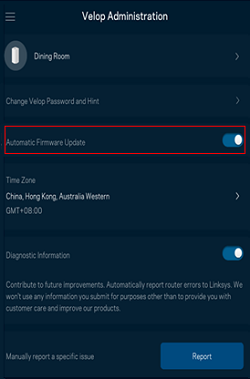 NOTE: For further assistance on how to manually update the firmware of your Velop, call Linksys technical support. Do not unplug or restart your Velop system during a firmware update. Wait until the light on your node is solid blue, indicating that your Velop is ready again. On a computer connected to the Velop's Wi-Fi, launch a web browser to access the system's web interface. For instructions, click here. 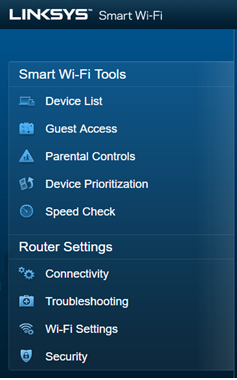 Click Connectivity under Router Settings. By default, the Automatic box is checked to allow automatic firmware updates whenever a new version is released. If you have more than one node in your Velop network, each will be updated. If you disable this feature, you will have to click the Check for Updates button to check if a new firmware release is available and upgrade the firmware. NOTE: For further assistance on how to manually upgrade the firmware of your Velop, call Linksys technical support. Turning OFF the automatic firmware updates feature of your node allows you manually upgrade its firmware. To do this, you have to download the firmware from the Linksys support website to your computer and upgrade it to your node. Choose your product below to download the latest firmware. 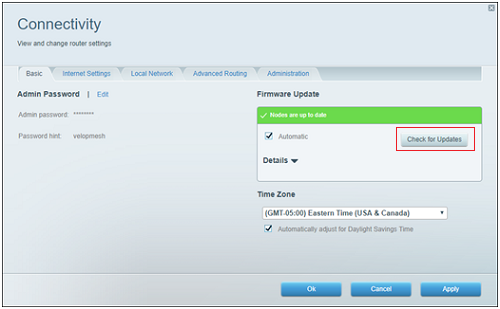 For detailed instructions on how to manually upgrade the firmware, click here.